I’m not a fan of New Years Resolutions, I think it’s a time for a detox, clear out and rest. Goals can just add to the weight of things we don’t achieve as Mums. Life Priorities help you to organise your time, energy and money spends for the year ahead and only focus on what is important to you. Imagine a year where you can finish it feeling satisfied that you covered all the most important bases (not everything, just the important stuff); it’s a good feeling! Think about everything that happened recently or in the last year that you can feel really grateful for (this means the ideas come from the heart, not the logic of the mind or emotion of the gut). What do you most want to be sure you have achieved? What would you be gutted not to have? I know three isn’t many, and that you will actually have lots of other priorities, and you are welcome to write down the others as well. But what I do want you to just pick 3. You’ll want to refine and polish them as time goes by, so don’t worry about making them perfect. YOU CAN”T GET THIS WRONG! Just Change It Later On If You Realise that other things are more important. There are reasons behind all of these, and reasons why they take the top rankings, and they are in no way a judgement on the fact that I know already that yours will be different. For example, for some parents the top priority is to provide every academic opportunity towards a secure future career for their children, or to ensure they make a great marriage, or to make sure they have amazing experiences, or to nurture them. Some Mums might not have a potential career option, or not at the moment, or not feel it’s in the top 3. Some might not have their health anywhere near the top 3 (I would really recommend that you consider how much it will help your kids if it is at least in your top 5 though). Others might have providing financially, or spiritually as the top priority. Maybe yours is maintaining your relationship (note to the hairy one: the reason our relationship is No4 is because me being strong has always been an important aspect to the success of our relationship). Why bother? Because we all get tired, overwhelmed, stressed, overloaded, exhausted, knackered, unfocussed and end up fire fighting and headless chicken running around at some point. If every morning you remind yourself what your top 3 priorities are, you will be able to make sure that AT LEAST those are done, and then the rest. Plus loads of things you’ll just not bother to do, saving you time, energy and money. Plus you can manage your weekly To Do’s and make sure that you at least make time for these three. I make time to hug my kids, because otherwise I get unhappy. I exercise 3 times a week, and eat pretty healthily. In my book, I talk more about how to pick your top priorities and find out more about you as a person and what you love to do, or have or who you love to spend time with, so if you’d like to find out more, remember you can read a kindle book without a kindle. 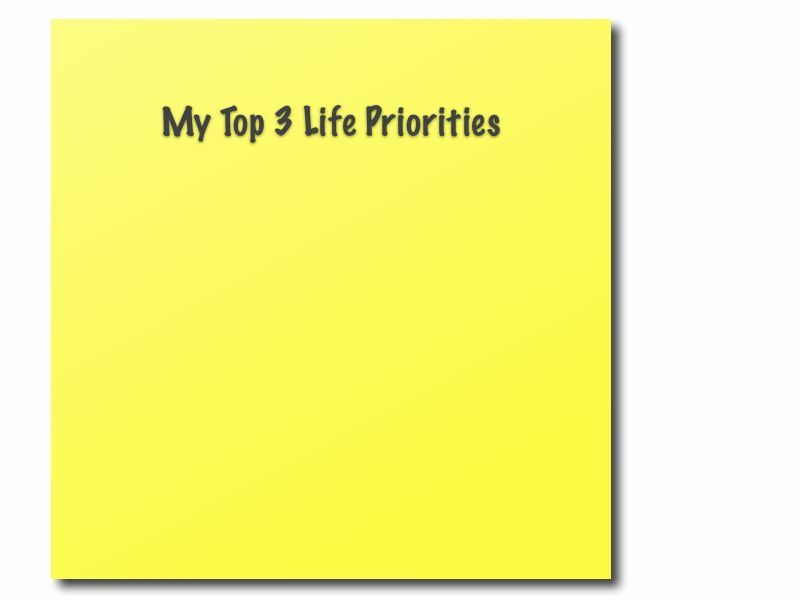 Fancy finding your Top 3 Life Priorities? Pop your top 3 priorities below when you’ve done it or come over to my Pinterest board and add them there.. If you blog about it you are very welcome to add a link in a comment to any blog posts you write about it, so that other Mums can get ideas for how it helps or what affect it has on you. Here’s a summary for you as a picture, I can’t wait to hear what you pick! My number one priority is spending time with my family. This isn’t because I’m a real homebody, it’s because I get easily distracted by other commitments or jobs and without thinking I let my family start slipping down the priority scale, ‘I’ll just do one more hour on this article’ or ‘just a few more days and this project will be finished’. I MUST make it a priority or else family gets taken for granted. I have one child and several older step kids. As my daughter has just turned 14 I have realised with more clarity than ever that I don’t have much longer with her like this. In a few years I will have to share her with the rest of the world and one day she will have her own family and her own stack of commitments to juggle. I don’t want to look back at these years with longing and regret, so I need to live them as I should now, while I have the chance. My second priority is my health. I need to return to having better fitness. Looking better is an extra benefit of simply feeling better and hopefully feeling better for longer. I agree, I’m the same as you with the family – hence my reminder to myself, because like you I’d really regret it if I looked back and hadn’t done it. Also I get niggly when I haven’t felt connected with the kids for a while. quality time is a brilliant priority. That doing something for me bit – if I had a new years resolution it would be to remember that my work-write and work-other and me-health-rest time are very different things, and that I deserve all of them. Thanks so much for some wonderfully sensible advice – you offer a much more realistic and ‘do-able’ alternative! Pingback: A New Year’s Revolution | Inking It.